Following Mr. Bean's words earlier, I decided I should probably do something about protecting the small amount of money I own. 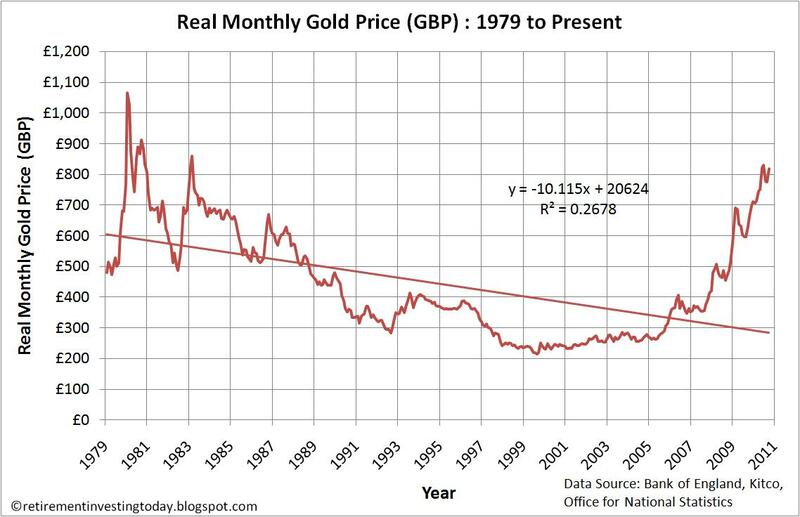 Gold, gold, gold everyone sings, but I looked at a graph of the price of gold, over the last 20 years. I'm still sat in cash, silly I know, but I honestly have no idea where to put it. It would be easy to put myself into an early grave, hoarding gold under my bed waiting for the revolution. But really, I am actually considering buying a house. Yes, it goes against everything I believe, but, if I can fix for 25 years, inflation can do what the hell it likes. Infact i'd welcome it. Everyone else appears to be having their house paid off by the BofE inflating away our debts. I'm 27 and have worked hard for everything I have, no debts, been waiting to buy during a collapse in prices which doesn't appear to be coming. I'm holding the towel in my hand and preparing to throw. Can anybody honestly give me a reason why I shouldn't buy a house? At least then I have something I can lock the doors on and store my food in if the worst comes to the worst. The quotes below your chart completely contradict the chart - I presume you include them because you don't agree with RB? You have plenty of options for your money depending on how long you want to lock it away for. Nothing is a particularly good bet right now though, so I would look for the beast savings rate you can get in an ISA, or buy some high grade corporate bonds. That at least might protect you against inflation. Hmmmmmmm. And your reason for not doing? If inflation goes hyper, the house will be paid off for the cost of a loaf of bread (provided the interest rates are fixed for the full term of the mortgage), will it not? If you can afford it, and it's your life's ambition to own a pile of bricks, then go for it and stop worrying. But you are 27 years old, why not rent a nice flat, live a bit, and forget about buying property for a few years? Better still, go and live abroad for a while and forget about the pile of poo that is the UK atm. I feel like the OP but, as I have said before, these are the most uncertain times that I have known in my life economically. I have no idea which way things are going - if anything, the 'net provides an information overload full of people with vested interests in inflation, deflation, gold, oil, wheat, shares, houses, cash, etc, etc. I honestly do not know which way to go. I am aware that I felt the same way when gold was 700 bucks and when it was 1,000 bucks. Will I be posting the similar in a year when gold is 2,000 bucks or will I be heaving a huge sigh of relief having watched it fall back below 1,000? My crystal ball is very murky. Whilst it is tempting to wish to speculate when you see assets rising the advice given in the main Moneyweek article today by John Stepak - if you are holding cash in order to put a deposit on a house then keep it in cash and find the best savings account you can - is worth heeding especially as he says that you should do this in preference to shares or gold... and we all know how much MW loves gold. October/Nov are usually months of economic shocks so perhaps the thing to do is batten down the hatches? BDEV fell almost 35 today btw if that means anything to anyone - TMT in my silly posts from this morning mode. Does that include being negative for 20 years like Japan? Frankly you pays your money and takes your chance. At the moment I'd rather have my money in cash getting +1%pa returns than property getting -10%pa, but it's your money so it's your choice. Yes, I have been trying to look ahead to 2011 and the hoped for at least 10% drop in house prices... I am looking at 300K houses or therabouts now so am thinking, hoping, that is 30K off the price of those by the end of next year... and then a lower offer... so I can kind of justify the lack of interest on my savings. I like you have done the same process apart from the fact i own a house with no outstanding loan. I decided not to play in Gold as it just dont feel right, I reckon the Gold market is pumped by traders just as badly as the stock market. So after much thinking I am transfering a percentage of my spare cash to Silver which looks a better prospect only snag is the VAT on Silver but you can get round it. I honestly cannot imagine why anyone who is 27 would want to buy a house in the UK. The standard of living is dreadful and is going to get a lot worse. No one know's what is going to happen, this site is about opinion, just use it as a guide for your own beliefs. The answer to your question would be a big YES, provided you had wage inflation at the same time. Gold is the red flashing warning light of the world economy. It is telling us (and has been for many years) that something is badly wrong. i dont think anyone suggests going 100% gold or 100% silver. as with all investing - have a portfolio, and yes, that can include cash. If you consider a 1% risk against a potential gain of excess 1% too risky - then stay in cash. There's bound to be a correction soon (unless THIS IS IT), so don't price chase. Be patient. No point in paying more than you have to. I prefer to wait until RB starts a "gold is crashing" thread before buying. If you're based in the UK this gold chart might also be of some use. Priced in GBP and Inflation adjusted. This is one of a few that I follow. That is saying that gold is near its peak more or less? 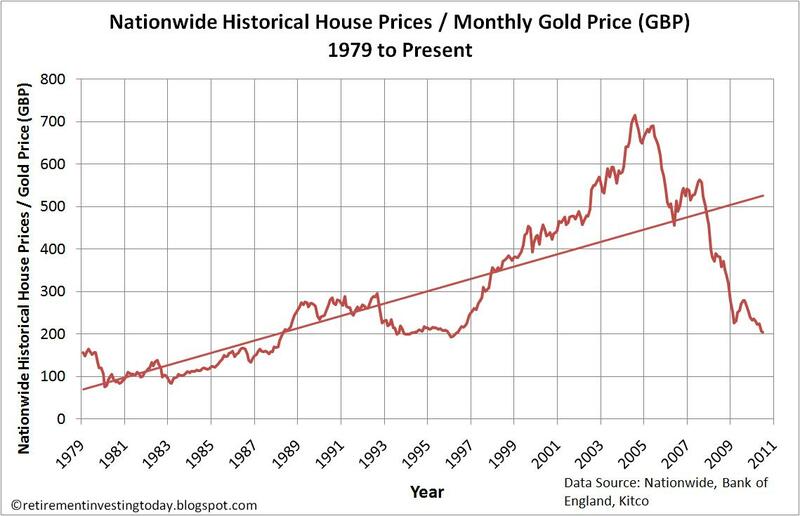 I think if you check it you will find that gold went up quite strongly for about 10 years against housing and inflation during the period 1971 to 1981. The same thing has just happened from about 2003 to present. The first bull run was reversed as soon as the US got serious about taming inflation. I believe that this bull run will be stopped when the US gets serious about their deficit spending. Maybe by Q1 next year there will be new attitude in Congress and a new economic team. Strange thing is that one of the best plays in the early 1970's USA was to buy a house. Everyone was on fixed interest 25 or 30 year mortgages and inflation almost wiped out the real value of principle and interest debt. In real terms monthly payments were cut by more than 1/2 by the effects of inflation. The chart only goes back to 1979. The previous "inflation adjusted peak" is £1,066 in 1980. What are we today - £828. So to my untrained eye still around 25% to reach the previous inflation adjusted peak. So no where near the previous peak. Nearly at the 2nd highest level though. Only have to make it to £859. are there any 25yr fixes available ? Title of the post was "How long until a house can be bought for a 100 ounces of gold?" Yes, and I think that is on many people's minds today.